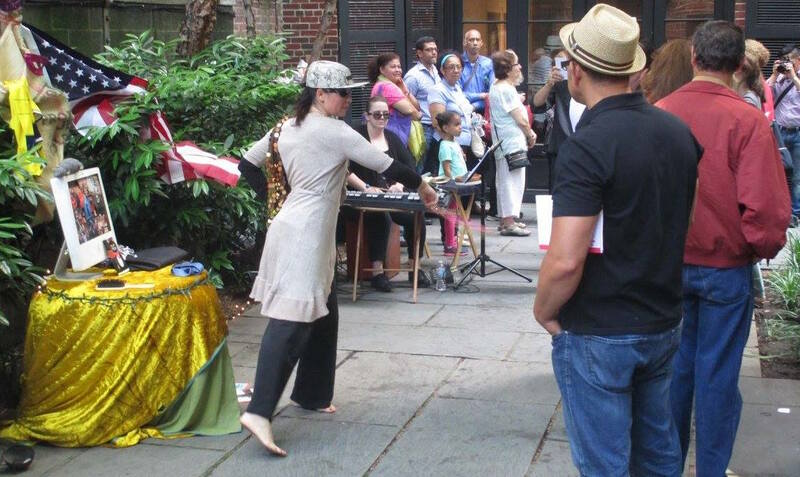 Centro Cultural Barco de Papel with the support of Instituto Cervantes New York, presented on its premises a day of theater, music, poetry and performance, revolving around the theme of the immigrant experience in New York City on Saturday, June 11, 2016 from 1 p.m. to 5 p.m. 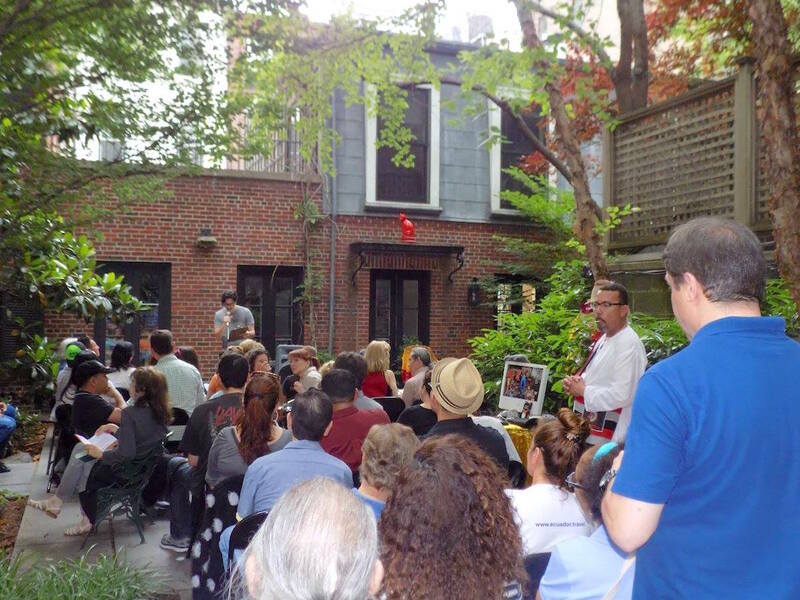 The Instituto Cervantes graciously granted their theater, gallery and garden space for the presentation of the activities scheduled for that day. 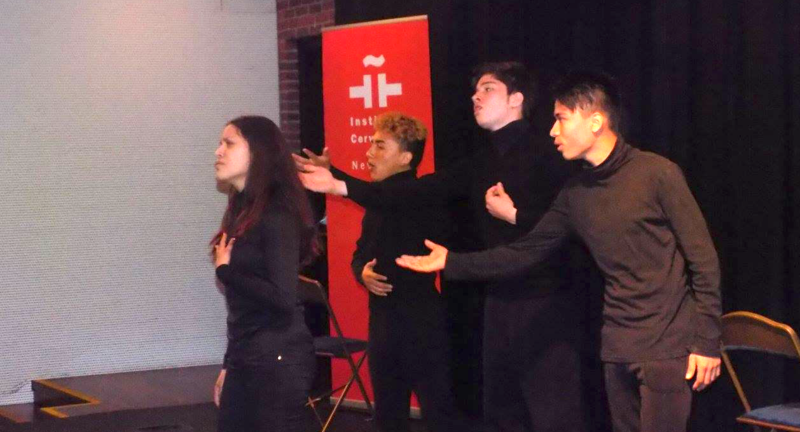 The focal point of the day event titled Our Own Cultural Identity was the presentation of the play ‘El Latino en Nueva York’, played by a group of students from Newtown High School in Elmhurst, Queens. The play was assembled and directed by Venezuelan playwright, Pablo García Gámez. The theatrical adaptation was based on the experiences narrated by the works of Puerto Rican writers Pedro Juan Soto, Rene Marques, Pedro Pietri and Julia de Burgos. Students, Carlos Mainato and Jennyfer Alexandra Bustos of Ecuador, Sebastián Trujillo of Colombia and Yeremí Cáceres of Nicaragua used the theater experience as an integrative tool to incorporate their own lived experiences. They incorporated musical elements that were present at the opening and closing of the play with the interpretation of the song ‘En mi viejo San Juan.’ Under the guidance and hard work of Gámez for several months, the students received extensive training to recreate a four-cornered picture of the reality and loneliness of an immigrant, particularly the Latin American immigrant. The presentation was a success because the students showed their preparation for the stage, causing the audience to erupt in emotive applause. At play’s end, the director moderated a session of questions and answers. The performance closed with the emotional words of Jennyfer’s mother. The immigrant experience was also the subject of the theatrical monologue ‘La Loca de la Estación’ by Dominican playwright José Miguel de la Rosa, staged by the Argentine director Fábian González and Venezuelan actress Laura Petit. The Madwoman of the Station is a story set in the 80s, a woman who after having lived as a child in a brothel run by her godmother, arrives in New York where she tries to rebuild her life. Her situation in the big city is so precarious and full of adventures in the attempts to survive; she ends up being one of the many homeless who swarm Grand Central Station looking for someone who will listen. Laura Petit showed her histrionic qualities in her recreation of ‘La Loca’ unfolding her monologue for the attendees who filled the gallery of the Instituto Cervantes. 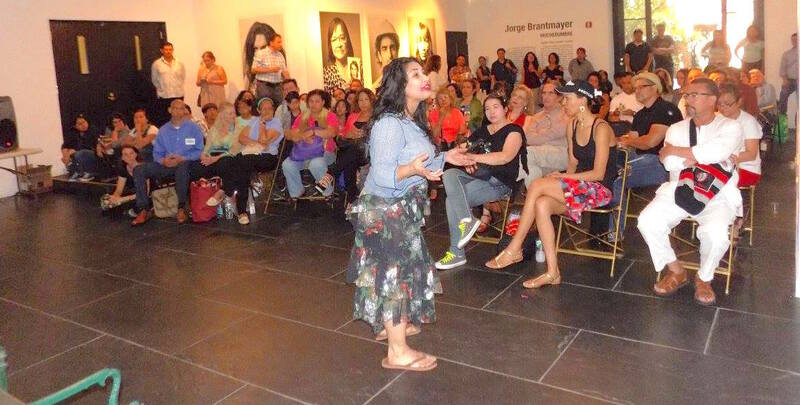 While Laura was acting, director González controlled the background music in the soundboard and playwright, José Miguel de la Rosa watched the enactment of his work from the first row of the audience. In closing the performances produced by Centro Cultural Barco de Papel, the soprano Raquel Sáenz Llanos performed the dance ‘La Cabaña’ by Colombian composer Emilio Murillo with lyrics by the poet Julio Florez, signaling the transition for the reception hour which celebrated the ten year anniversary of the independent editorial Book Press NY. Book Press NY is dedicated to publish books on contemporary issues, investigative journalism and literary works. 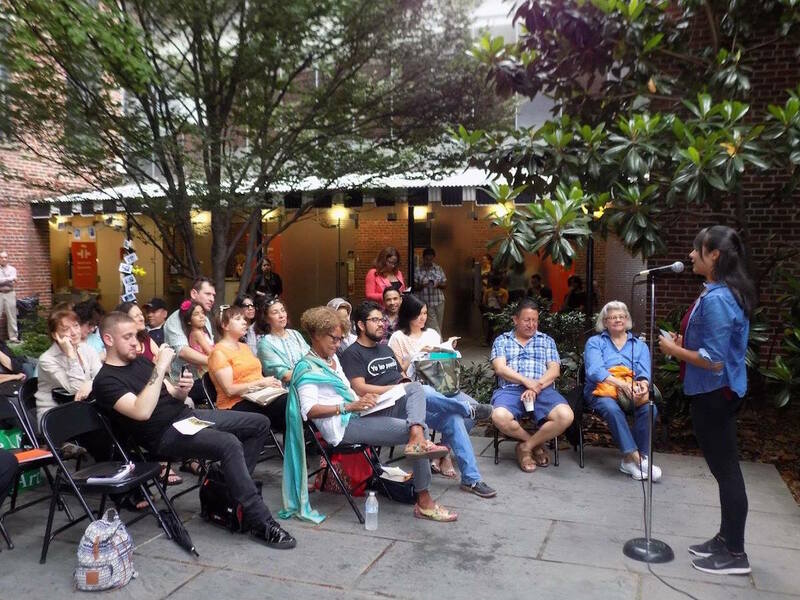 The publisher prepared an independent program in the gallery for Book Press NY that included writer Miguel Falquez-Certain, editorial founder, Jacqueline Donado, soprano singer Raquel Sáenz Llanos and the Costa Rican jazz musician Ray Perez. The event closed with a wine reception. 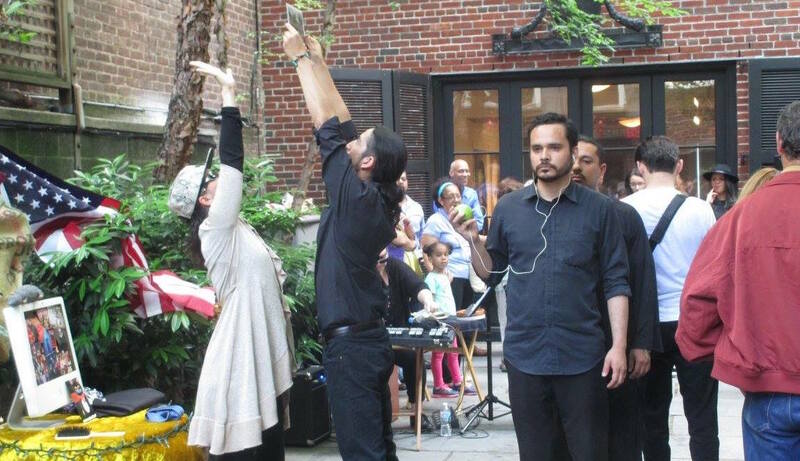 The group ‘Poetas de Nueva York’ took the gardens with a concept they call moto-poetismo or poetry-in-motion because it uses the body the stage as a means and music as the link. ‘Cuatro Altares’/Four Altars explored the performance of the individual identity of our time from different radical and contradictory angles. The play was written, arranged and directed collectively through the partnership of Colombian poets Iván Hincapié, Nicolás Linares and Diego Rivelino, Venezuelan contemporary dancer Frahydel Falczuk and American percussionist Kat Stock. The members of the group made every passageway of the Instituto Cervantes their own, amidst an eclectic decor that helped audience members absorb the tactile ideas of their work. The attendees inadvertently became part of the performance, for the actors incorporated them in, enhancing the performance with a unique essence. 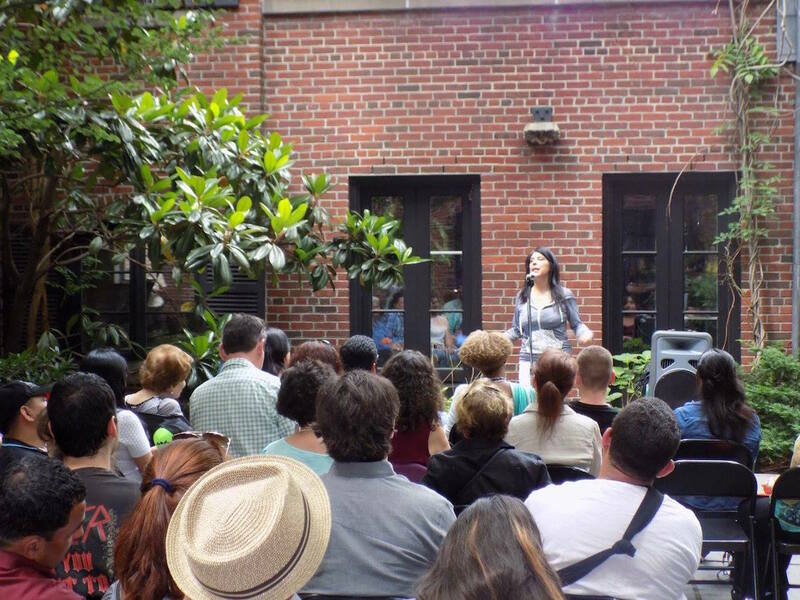 An open microphone sandwiched the three programmed events, opening and closing the event in the garden of the Instituto Cervantes. Poet Luis Henao moderated, using a few minutes to introduce each participant. The following participated in our open microphone: Miguel Falquez-Certain, Rómulo Páez, Alex Cabrera, Juliana Javier, Maria Palitachi, Denisse Español, Ana Martínez, Amneris Morales Alejandro Uriza, Héctor Alves, Tonia León, Misael Lagunas, Luis Rodríguez Ortiz, Leonel Riera, Mariela Rea, Marielis Acevedo-Irizarry and Gorman Mejía. A fundamental Centro Cultural Barco de Papel member, Cuban musician Jesús “El Guantanamero” Álvarez, closed the evening with lively renditions of song that all attendees joined in through voice and dance. See photos of the event on our Facebook page. Migratory experiences are recounted in the works of Puerto Rican writers Pedro Juan Soto, René Marqués, Pedro Pietri and Julia de Burgos, through the interpretation of a group of students from Newtown High School, contemplating the New York metropolis through the eyes of the newcomer, immersed in stories of a timeless anguish, recounting similarities to our own immigrant experiences. This presentation was directed and prepared by the Venezuelan playwright Pablo García Gámez, recreating a perfect picture of a city inhabited by souls swarming its orbit. It speaks of the loneliness of the immigrant inhibited by four walls, a reality that we have all lived in one way or another. Carlos Mainato (Ecuador) Moved to the U.S. 3 years ago and successfully completed high school. He aims to go to college and study acting. He has worked on two plays at school and decided to participate in the play to learn acting techniques that would be useful in the future. Jennyfer Alexandra Bustos (Ecuador) Graduated high school this year. She wants to study to become a Spanish teacher. She has participated in four plays at Newtown High School: Romeo and Juliet representing Juliet, ‘Ah! Qué familia’ as “La Peque”, ‘El amor en tiempos modernos’ as the role of “Amanda” and “La casa de Bernarda Alba’ as Adela. Sebastián Trujillo (Colombia) Successfully completed 9th grade. He opted to participate in the play because he likes acting. He has participated in a Colombian soap opera called, ‘Un sueño llamado salsa,’ as an extra and since then has discovered his love of acting. Yeremi Cáseres (Nicaragua) Currently lives in New York City and also competed 9th grade. He opted to participate in the work because he wants to lose the fear of being on-stage. Pablo García Gámez (Venezuela).García Gámez is a member of the Latino Artists Round Table. In his formation as a playwright, he has participated in numerous literary congresses, workshops and symposia. He recently completed his doctoral dissertation on the relation between memory and Hispanic theater in New York at the CUNY Graduate Center. His work “Oasis Pub” (1987) was released at the Festival de Nuevos Directores (Festival of New Directors) in the Rajatablas Theater in Caracas, Venezuela. In 2014, the anthology Palabras acentuadas (Accented Words) published his “Oscuro de Noche” (Dark by Night). His piece “Blanco” (White) won the Proyecto Asunción de Teatro Pregones competition in 2004, the HOLA Award in 2006 and the ACE Award in 2007. In 2013, his play “Noche tan linda” (Such a Beautiful Night) won the Proyecto Asunción. In 2014, he won the HOLA Award and the ACE Award again in 2015. In the same year, “Las damas de Atenea” (The Ladies of Athena) won the HOLA award. La loca en la estacion is the story of a woman who after having lived as a child in the brothel run by her godmother, arrives in New York where he tries to rebuild his life. Its location in the big city is so precarious and full of adventures to survive; she ends up being one more of the many homeless who swarm Grand Central Station looking for someone who will listen. The play is set in the 1980s. Laura Petit (Venezuela) Trained as an actress at the National Youth Theater of Venezuela (TNJ) between 1995 and 1996. With TNJ, she performed in several theatrical works and assisted with diverse national and international festivals. In cinema, she was part of the movie cast “Piragua del Sur,” directed by Ricardo Ball. In 1996, she graduated with a social communication degree. In 1998, Petit won a UNESCO scholarship for an artistic residency in the Center for the Theater of the Oppressed in Rio de Janeiro directed by Augusto Boal. During her stay in Brazil, she was assistant director for the piece “El mendigo o el perro muerto” by Bertold Brecht. In 2004, she graduated with a master’s of communication sciences. As an actress, she has participated in important theatrical productions such as William Shakespeare’s “Noche de Reyes” – better known in English as Twelfth Night, with Maracaibo’s acting company “Actores de la Ciudad” and more recently, “Bifronte,” a dance/theater piece. Petit has worked on the television platform as a show presenter and on radio as an announcer and actress. As a higher education professor, she has imparted her breadth of knowledge in corporal expression and semiotics at the Cecilio Acosta University in Maracaibo from 2001 to 2003. From 2008 through 2015, she taught corporal expression and vocal education in the Inés Laredo Theater School, which is affiliated with the Ministry of Culture of the Zulia State, in Maracaibo. Since 2014, she has taught several courses at Zulia University, including History and Theory of Western Theater, History and Theater of Latin American and Venezuelan Theater, and “Theater of the Oppressed” in the Scenic Arts School of the Experimental Art Faculty. José Miguel de la Rosa (Dominican Republic) Studied Hispanic American literature at City College (CUNY). He was a member of the literary group Pensum. He is co-founder of the Hispano/Latino Cultural Center of NYC. As a screenwriter, he forms part of the Theatrical Group and one of his works, “El hombre que esperaba en el camino (The man waiting on the road),” presented in 2013, it has been included in the first anthology of the group, published in October 2014 under the name of Palabras Acentuadas. He has published two poetry books: Entre sonrisas y sueños and Otra latidud. Some of his works appear in the following anthologies: Niveles del imán, La espiga del siglo, Tertuliando, Historias de Washington Heights y otros rincones del mundo, Viajeros del rocío, and Noches de vino y rosas (Obsidiana Press, 2010). He has published one short piece: La loca de la estación Grand Central (Micielo Ediciones, México, 2010). and Abroms Arts Center. Fabián was nominated for the “ACE Award” as Best Actor in a Supporting Role 2008 for The Wizard of Oz and “ACE Award” and “ATI Award” as Best Actor in a Leading Role 2013 for “El hombre que esperaba en el camino,” Teátrica Producciones, and he was given the “ATI Award” as Best Actor in a Leading Role 2015 for Ausencia. “Four Altars” is a collective proposal motopoética Poets in New York. In this experiment performative identity of the individual of our time is explored from different angles radical and contradictory; using poetry, body and stage music as a medium and as a link. Ivan Hincapie (Colombia) Literary Workshop was part of the Fragua of Pereira, with which published Sol Apart (2000). He participated in the First Meeting of Inéditos the Coffee Manizales (1999) Writers and the First National Poetry in Pereira in 2001, organized by the magazine “Luna de Locos”, with whom he has collaborated on several occasions. Since 2002 he resides in New York where he has published his poems in various magazines: “Walls” and “unawares muses,” and under the seal of the Workshop The Drunken Boat gave birth to her collection of poems Other Self (2007). 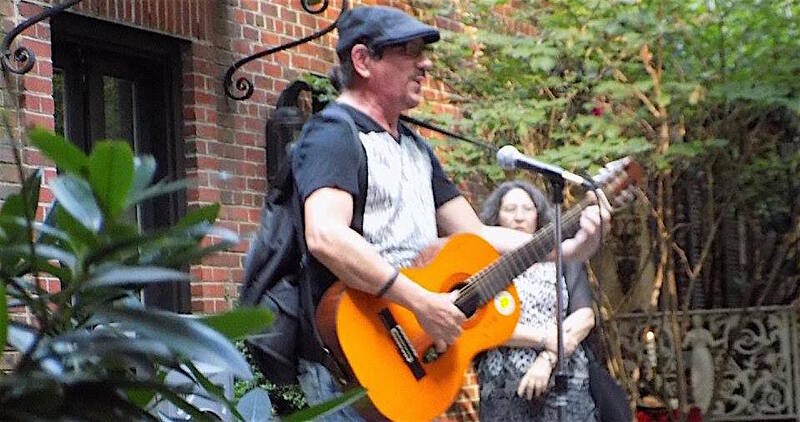 In recent years he was on the editorial board of the Cultural Newspaper neighborhood and has been a member of the Collective Poets in New York, is now rat. Nicolás Linares (Colombia) Resides in NYC since 2004. Poet, political and cultural activist, independent philosopher, founder of the Republica Poética de Funzatativa in Colombia. Organizer and member of the Colectivo Poetas en Nueva York where with each passing year has organized activities like the Culture Marathon, the literary workshop La Rata, La Otra Orilla open microphone, the Festival de Nueva Poesía ‘Poetas en Nueva York,’ and the triannual publication of the cultural newspaper ‘Vecindad.’ He was director of the magazine La Orgullosa Calquita, as well as collaborator with different publications and magazines like: Hybrido Magazine, El Barco Ebrio 1 and 2, Revista El Ático and Casa Tomada amongst others. Linares has published two poetry collections: Los Hijos de Tisquesusa (Bogotá, 2004), SINASCO Sindicato de Astronautas Colombianos (Nueva York, 2007) and Alteración del Orden Publico (Nueva York, 2009). Frahydel Falczuk (Venezuela) Graduated as an architect from the Central University of Venezuela with a master’s degree in urban design. She simultaneously studied contemporary dance at the Dance Institute of Caracas. She lives and works as a designer in NYC. Her goal is to pursue research that promotes activities where public space meets with dance and other artistic expressions. Kat Stock (USA) is a percussionist and music teacher. She graduated from the Aaron Copland School of Music of Queens College and holds a master’s of science in music education. Kat is currently involved in a series of projects where she explores the relationship between sound and improvisational poetry. She teaches music with the NYC Department of Education and works on independent percussion projects.